This recently recovered film involves the theft of a diamond from a Rhodesian mining concern, though its real interest is inter-racial relations. Harold Shaw's final production in Africa involves the theft of a diamond from a Rhodesian mining concern. 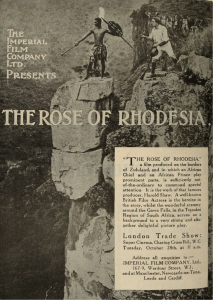 The diamond is called ‘the rose of Rhodesia’, but Rose is also the name of a prospector’s daughter (Edna Flugrath, Mrs. Shaw), whose attractions, first to the diamond thief, and secondly to a missionary’s son, account for the melodrama.But the film is distinguished in particular by its portrayal of Africans and how inter-racial relations become the film’s real interest: the hero is friendly with Mofti, son of the chieftan Ushakapilla, and a white rose is given as a symbol of their friendship. Ushakapilla is planning an uprising against white rule but after Mofti’s accidental death, Ushakapilla relents. The progressive view of Africans offered in The Rose... would not appear in South African cinema for many years thereafter.